Five traditional foods from Madrid that you MUST eat on your next trip to Spain. From tortilla espanola to churros to huevos rotos, these five foods are essential for food-loving travelers to Spain’s capital city. You may have heard of the culinary hot spots of Barcelona and Seville, but did you know that Madrid is also a foodie traveler’s paradise? The capital city of Spain is a pit stop on most travelers’ must-see lists, but wanderers who love to explore a new country and city through food will fall in love with the delicious and unique foods that Madrid has to offer. Restaurants and pubs line Madrid’s winding streets as far as the eye can see, and you’ll never find a shortage of Rioja wine or spiced sangria. 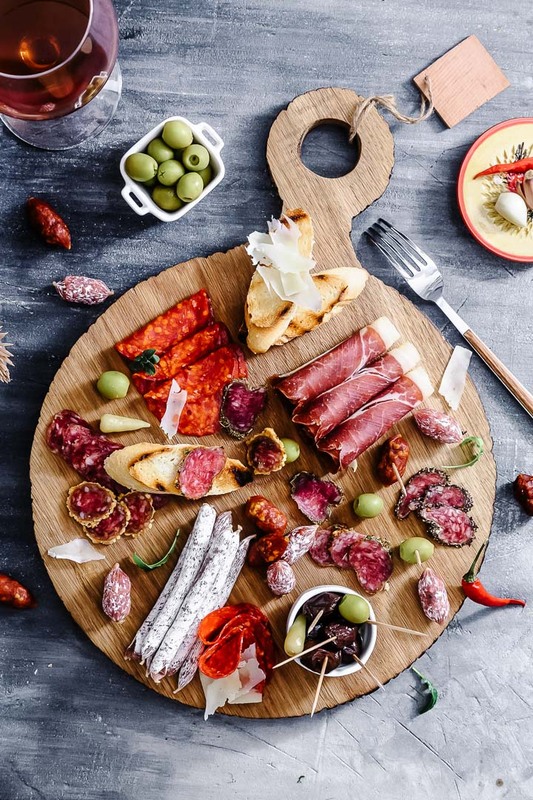 While you may know typical tapas dishes characteristic of Spanish cuisine, you’ll find many traditional foods from Madrid that you simply can’t miss. If you were to spend one perfect day in Madrid, you have to try the following five foods. Sangria isn’t optional! When most Americans hear the word tortilla, we automatically think of the thin corn flour wraps that are popular in Mexico and throughout Central America. In Spain, the tortilla is much different and is also called a tortilla de patata. Here, it’s a baked dish made of sliced potato and egg that’s similar to an Italian frittata or a crustless quiche. Typically served by the slice at room temperature, the tortilla is an essential dish when visiting Madrid. Did you think churros originated in Mexico? Think again! The cinnamon- and sugar-covered fried dough is a typical dessert from Madrid that has become popular throughout Latin America as well. To eat like a local in Madrid, order your churros for breakfast with a cup of hot chocolate. Huevos rotos translates to “broken eggs,” which perfectly describes this versatile dish. It includes two eggs broken over fried potatoes, and it’s often accompanied by ham and a sprinkle of cheese. Huevos rotos is a popular dish any time of day, but it’s especially good for satisfying late-night cravings after one too many pitchers of sangria. Know before you go: the Spanish love pork. While the nose-to-tail meat philosophy is gaining steam on this side of the Atlantic, the Spanish have been eating the entire animal for hundreds, if not thousands, of years. One example of this is oreja de cerdo, or pig ears. Typically sliced thin, fried, and served with a spicy sauce, pig ears are a common bar food found throughout Madrid. Spain is known for its love of ham, but the Spanish also love their seafood, particularly calamari. One of Madrid’s most popular dishes is bocadilla de calamares, or a fried calamari sandwich with garlic aioli. I didn’t say all of these dishes would be healthy, but I can promise they are delicious. As you can see, Madrid is a culinary capital of Spain that offers much more than your typical tapas, patatas bravas, and paella experience. So step outside your food comfort zone, munch on a pig ear, and tip your glass of sangria to all you will taste and experience in Madrid! Loving these traditional foods from Madrid? Check out our essential list of foods to eat in Korea and the 11 Foods You MUST eat in Peru!